PLEASE READ CAREFULLY BEFORE ACCESSING MATHBITSNOTEBOOK.COM. 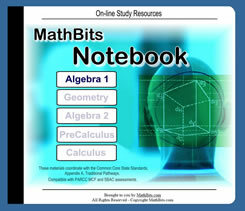 You may freely access the on-line MathBitsNotebook.com content for your own, non-commercial, private use (or for private use within your own classroom with your face-to-face students). You may NOT, however, create your own hardcopies/handouts/worksheets or Internet postings using content/graphics from this web site (in part or whole). You may NOT use "snippets" of MathBitsNotebook.com content to create hardcopies, projectable lessons, or for Internet posting. If you want matching hardcopies of the practice pages, please purchase our subscription resources (JrMathBits.com, AlgebraBits.com, GeometryBits.com or Algebra2Bits.com), which allow us to financially support this "free-access" and "ad-free" web site for your use. You may link to content at MathBitsNotebook.com from a non-commercial site (and are encouraged to do so), as long as the link does not state or imply any sponsoring of your site by MathBitsNotebook.com or Frederick and/or Donna Roberts. Linking must not present MathBits.com content framed within a personal web site, a school web site, or any other web site. When linking, please use a plain hypertext link (do not use content, snippets, or graphics for linking). Please no deep linking or inline linking. You may quote a small section of MathBitsNotebook.com as in keeping with the "Fair Use" statute. READ CAREFULLY: "Fair Use", as it applies to copyrighted materials, is for the purpose of commentary or critical review for a limited period of time with limited distribution. Such "Fair Use" does not extend to the re-posting of the materials to the Internet/Web. "Fair Use" must also leave copyright notices and/or authorship intact. As applied to educators, "Fair Use" is for use within the teacher's immediate classroom setting only (for a short period of time). Educators are not to re-post such materials to the Internet: "No exclusively educational purpose is guaranteed by putting material on the Web, and such conduct violates the copyright holder's right of public distribution." You may not copy/reproduce the content from MathBitsNotebook.com (in part, whole, or modified form) for any form of distribution or display. Examples of such distributions or display include (but are not limited to): handouts or lessons for classroom use, projectable lessons, conference presentations, project booklets, departmental handouts, workshop handouts, grant-based project materials, booklets, pamphlets, posting to school web sites, posting to personal web sites, etc. Use of these materials on any other web site for any purpose is prohibited. Re-posting to the Internet is not considered "fair use" for educators as it violates the copyright holder's right of public distribution. Linking to content at MathBitsNotebook.com is acceptable, but re-posting of the content from MathBitsNotebook.com is copyright infringement. You may not use MathBitsNotebook.com content as private tutoring lessons/materials for which you are paid. You may not link to MathBitsNotebook.com content to be used for commercial tutoring. You may not use the content (in part or whole) from MathBitsNotebook.com as your course lessons and/or practice materials when teaching an on-line course. In addition, you may not re-post (copy) any of these materials, in part or whole, to the Internet, intra-net, or any public/internal distribution format. You may not use any URL links to web pages and/or materials at MathBitsNotebook.com as part of any on-line course. NOTE: Commercial on-line offerings (such as course web sites, tutoring services, etc.) are NOT to copy content (in part or whole) from MathBitsNotebook.com, nor use any URL links to web pages and/or content at MathBitsNotebook.com in any form or manner. You may not copy, import, snag, etc. the web site MathBitsNotebook.com to be used in part or whole, by others. Content from MathBitsNotebook.com may not be copied, framed, mirrored, downloaded, uploaded, burned, snagged, or installed electronically in any manner on any server. You most certainly may not present the content from MathBitsNotebook.com as your own Internet/computer based content by copying the content with the copyright/authorship removed. You may not copy, modify, and/or distribute MathBitsNotebook.com content for commercial use by profit making projects and/or organizations. You may not use the graphics (such as, but not limited to, diagrams, graphs, clipart, animations, phototgraphs, photo objects, banners, drawings, and/or any combination of the like), in part or whole, from MathBitsNotebook.com. The graphics at MathBitsNotebook.com were purchased or licensed for use on MathBitsNotebook.com. We pay for the legal rights to post these graphics, and these graphics are not free for the taking. The graphics are not to be copied or modified for personal, educational, or commercial use. [Note: Copying graphics from the Internet may place you in danger of copyright infringement from BOTH the posting site and the graphic's commercial licensing company.] Graphics at MathBitsNotebook.com are not to be directly linked (hot linked). The content presented at MathBitsNotebook.com carries no guarantee or warranty. No one at MathBitsNotebook.com involved in creating, producing or delivering the site accepts liability for (but not limited to) student progress, educational testing scores, educational program completion, teacher employment, or teacher professional progress. In addition, no one at MathBitsNotebook.com accepts liability for the improper or incorrect use of these materials. Content is provided on an "as is" basis and use of this content is at your discretion.